According to Mini Dhingra's grandmother, "Every good Punjabi girl should know how to make paneer from scratch." Recently, as Mini finished a perfect batch of the Indian cheese, she said with a big smile,"Well, I guess I have arrived." A few years back, Mini's mother visited her from India, and she enjoyed talking with Mini's neighbors in the building elevator. She quickly led the conversations to food, and within days of her arrival, Mini heard her ask a neighbor, "And what can I make for you?" The next day this lucky neighbor received a homemade Indian meal. Mini laughs when she tells the story and adds, "I got my love of cooking from my mother. How could I not?" Mini grew up in Calcutta, raised on the fresh cooking of her mother's kitchen. 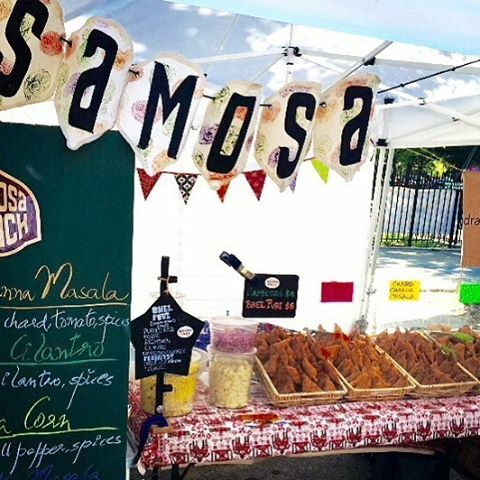 Today through her growing business, Samosa Shack, Mini shares her memories of India as a young girl. Samosas are little dough pockets with savory fillings. They are one of the traditional street foods that Mini often ate as she walked home from school. She's inspired by the smells and tastes of her past, yet her own kitchen talent keeps her experimenting with new interpretations. This week, Mini is making Beet Coconut Lentil Samosas, along with three other varieties. She thinks about texture and color as she develops new ideas for her next samosa. "I eat with my eyes," Mini says. At the farmers market, she's energized by the farmers' colorful seasonal harvest, as well as through her interactions with her customers. "I love talking with people because samosas always spark a conversation. People ask, 'What is this?' 'What's inside?' Then the conversation sparks my memories." Today Mini is raising her daughter, who by age 12, could already make an excellent samosa. "Maybe she's not as fast as I am, but her samosas are already as good as mine."